Some 20,000 American boys and girls lost their fathers during the Vietnam War. Their stories serve as powerful testimonies about the true cost of war. 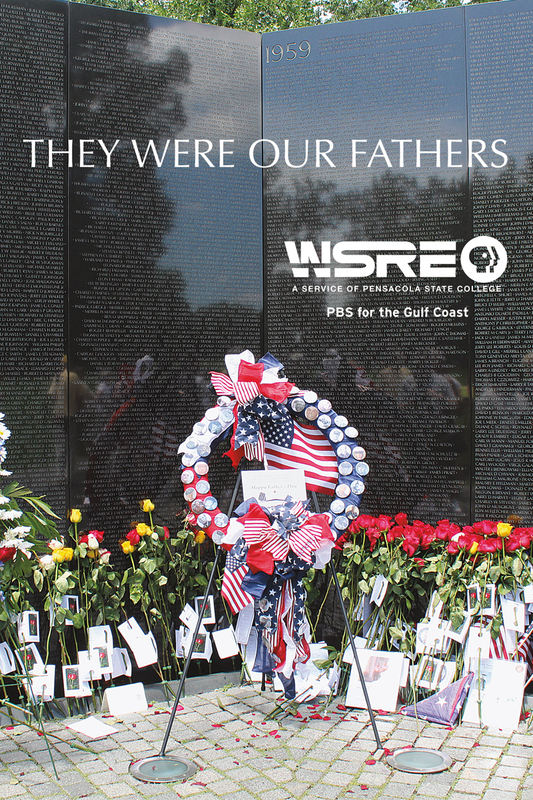 WSRE is proud to present They Were Our Fathers, a documentary filmed in Washington, D.C. at the Vietnam Veterans Memorial as hundreds of these children, now men and women, honored their dads on Father's Day with a special ceremony and remembrances left at The Wall. Members of Sons and Daughters in Touch—a group formed in 1990 to locate, unite and support America’s Gold Star children who lost their fathers in the Vietnam War—gather in the nation’s capital every five years on Father's Day to honor their fathers, reflect on their common grief and support one another, like no one else can. Under the direction of Executive Producer Jill Hubbs, WSRE producers/directors James Roy and Ted King traveled to Washington, D.C. last June to interview these sons and daughters. Their stories have been documented in a new film, They Were Our Fathers, which first premiered on WSRE on Father’s Day 2016. The film is narrated in first person by Hubbs, whose father became missing in action during his second tour of duty in Vietnam on March 17, 1968. U.S. Navy Cdr. Donald Richard Hubbs was commanding officer of the world famous VS-23 Black Cats and was stationed aboard the USS Yorktown in the Gulf of Tonkin when his S-2E Tracker reconnaissance aircraft disappeared off the North Vietnam coast. Each of these Gold Star sons and daughters has a unique story to tell. They are bonded together in tragedy but also joined together in patriotism, honor and respect for the fathers they loved and lost. Their stories serve as powerful testimonies about the true cost of war. They Were Our Fathers has been archived by PBS Stories of Service at pbs.org/veterans, and it has been screened at the Ronald Reagan Presidential Library, the Richard Nixon Presidential Library and the National Naval Aviation Museum.